Freedwoman o the clan Aurelius an Priestess o Sol Invictus in her native veelage. (Doubtfu). 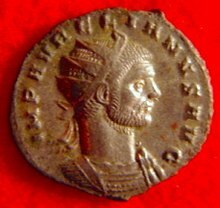 Aurelian (Laitin: Lucius Domitius Aurelianus Augustus; 9 September 214 or 215 – September or October 275), wis Roman Emperor frae 270 tae 275. ↑ In Clessical Laitin, Aurelian's name would be inscribed as LVCIVS DOMITIVS AVRELIANVS AVGVSTVS. ↑ His full name, wi honorific an victory teetles, wis Imperator Caesar Lucius Domitius Aurelianus Augustus, Germanicus Maximus, Gothicus Maximus, Parthicus Maximus, Restitutor Orientis, Restitutor Orbis.